Bibliography: “Gnomic Stanzas” is from The Penguin Book of Welsh Verse, translated with an introduction by Anthony Conran (Penguin, 1967, pages 99–100). ¶ [“Mountain snow, white is every place…”] is from Studies in Early Celtic Nature Poetry, by Kenneth Jackson (Cambridge University Press, 1935; reprinted 2011, pages 58–61). ¶ “RBH col. 1028” [= Red Book of Hergest, column 1028] is from Early Welsh Gnomic Poems, by Kenneth Jackson (University of Wales Press, 1935; third impression 1973, pages 22–26). ¶ The poem was supposedly written in the 12th century. Back story: In 2003, I brought an anthology into the house—one of these classic hodgepodges, mainly trading on the reputations of the two big shots who did the compiling. I doubt I would buy such a book today. They tend to lie around unread. Indeed, by 2003, anthologies of any description were already receiving a lot of skeptical looks in this household. Nadya (who at that point had lived with me for seven or eight years) grabbed up the book and slammed it open to a random page in the middle. She goes: “Let’s just see”—and proceeded to read a poem whose translator had given it the title “Gnomic Stanzas.” She and I, little suspecting, were both instantly vaporized. It’s interesting to observe how long things can take. To cook, I mean. I must have read “Gnomic Stanzas” twenty times before I ever looked up the word gnomic. It didn't mean what I thought. I thought it meant something like “enigmatic”—and I guess it can mean that. But in the context of old poetry it means anything said in the spirit of “One generation passeth away, and another generation cometh.” The poet says things that are obvious and undeniable but with a cosmic resonance. Elemental truths are heaped up, and some more debatable items slipped in, so these can share in the general approval. It’s a very ancient method. One would think that since I was so excited by the piece I would take the trouble to find out if there were more poems like it. What do I know about Welsh. And I did do this. The pressure had to build for ten years, but eventually I ordered some hard-to-gets and read all the footnotes. It appears there is a great mountain of medieval Welsh poetry, with its own saints and stars and MVPs, but only a few poems written on the model of my belovèd. Nine or ten of ’em are in the codex known as the Red Book of Hergest, a leaf of which appears above. These poems, all of them, are irresistible to a certain type. Comment: This version, first encountered by me in The School Bag (ed. Seamus Heaney and Ted Hughes), is about half the length of the original poem. No good comes of too much sleep. Though they never come together. Rarely a knave's without litigation. There's need of prudence in exile. Heavy, O man, is sin. Usually the calm are comely. There's no hiding evil, no matter where. Bad eyesight puts a man in prison. Thieves and a long night suit each other. Let the skillful hide his purpose. I hope I shall not live to a hundred. Where there's no learning, cannot be talent. Big words add to any disgrace. To warn the unlucky does not save them. If you visit him too often. Every time, a fool gets hurt. Comment: Below is a translation of the entire poem, including blanks where the manuscript is illegible. The translator, Kenneth Jackson, is best known as the creator of a beloved anthology: A Celtic Miscellany, continuously in print since 1951.
good does not come of excessive sleeping. a mischievous man is rarely without litigation. there is need of discretion in the alien. slow is the old man, easy to overtake him. I recognize what is shameful wherever it be. hateful is he who oppresses. this is not like a summer say. grievous, my friend, is sin. it is usual for the calm to be comely. evil does not conceal itself wherever it be. an ill countenance hampers a man. the healthy and free, it is strange that he complains. usual for the wounded is lamentation. woe to the woman who gets a bad husband. woe to the man who gets a bad wife. well agreed are the thief and long night. the sluggard does not soon avenge an insult. everyone does not get what he wants. alas, for longing, my brothers. usual is every hurt upon †the wretched†. the skilful, let him conceal his design. greybearded is the ice; the brave is on the exposed side. I pray I may not be a hundred years old. where there is no learning there will be no mental facility. longing for the dead does not avail. the coward fosters many hurts. a third foot to the aged is his stick. the perverse is not willing to listen. talking big increases the disgrace. warning avails nothing to the unfortunate. usual is every hurt for the fool. Comment: Below is the original poem, as transcribed by Kenneth Jackson. The character that looks like the number 6 is rendered as a "w" in a much more recent book, Early Welsh Gnomic and Nature Poetry, ed. Nicholas Jacobs (Modern Humanities Research Association, 2012). ny da6 da o drachyscu. reit oed deall y alltut. h6yr hen, ha6d y ordiwes. mi a atwen veuyl lle y bo. a disgynnu bar ar araf. tr6m, a 6r, y6 pecha6t. nyt ymgel dr6c yn lle y bo. drycdrem a wna dyn yn gaeth. iach ryd, ryueda6t pa g6yn. gna6t gan bob anauus g6yn. g6ae wreic a gaffo drycwr. g6ae 6r a gaffo drycwreic. kytuyt lleidyr a hir nos. ny moch dieil meuyl meryd. nyt ef a geiff pa6b a uynn. och, rac hiraeth vy myodyr! gna6t pob anaf ar dieid. baryfl6yt re6; gle6 y erchwynn. lle ny bo dysc ny byd da6n. hiraeth am uar6 ny weryt. trydyd troet y hen y ffon. dir yeit ny mynn g6aranda6. rybud y dr6ch ny weryt. ny bydei gymyda6c neb rei. gna6t pob anaf ar a a[n]noeth. 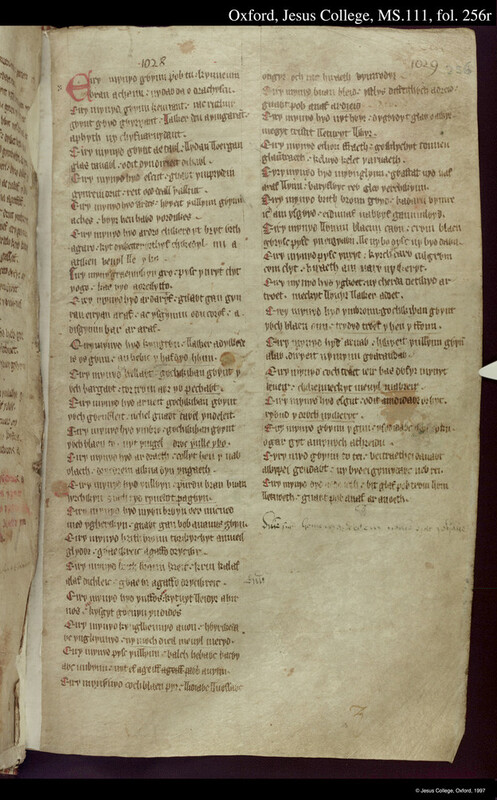 Appendix: Click the link below to listen to David N. Klausner, Professor Emeritus of English and Medieval Studies at the University of Toronto, reading "Eiry Mynydd" aloud in Welsh. Klausner is an authority on the pronunciation of various medieval European languages, and was kind enough to make this recording for me in 2012.